From thirty to forty years ago the name “Dodge City” was almost a synonym for outlawry of every description. Today  Dodge City is one of the thriving and prosperous towns of southwestern Kansas, a city of peace and order, of good homes, good schools and churches, and a citizenship that for worth and enterprise will equal that of any town of similar size in the state. The transformation and reformation have been accomplished through the efforts of men stout of heart and of noble purpose, who truly desired a better order of things and bent their energies to attain it. Of the work of these men, that of Hamilton B. Bell stands out prominently. He was born July 31, 1853, on a farm in Washington County, Maryland. Death deprived him of a mother the year of his birth and nine years later, or in 1862, his father died, leaving him the youngest of three orphaned children. For a few years he lived with an uncle at Hagerstown, Maryland, where he received limited educational advantages, and at the age of fourteen went out into the world to make his own way. At Waynesboro, Pennsylvania, he secured employment as a salesman in a jewelry store and remained there five years. In 1872 he started west, working his way by repairing and cleaning clocks. He reached Lawrence, Kansas in June and from there went to Abilene and then to Ellsworth. July found him at Great Bend. After several months’ employment there as a hack driver he gave up that work and engaged in the ice business on his own account. That proved a profitable venture. In September, 1874, he removed to Dodge City and with five teams began to fill a contract he had secured to haul cross ties for the Santa Fe railroad, then being built through to Colorado. This occupied his attention for several months, but in 1875 he returned to Dodge City, where he opened a livery business and conducted it for twenty-four years. Shortly after his removal to Dodge City his bravery and fearlessness caused him to be made deputy sheriff, in which capacity he served three years. Afterward he was made sheriff and served in that office in the “cowboy” days, when that section was a wild frontier and tried men’s souls to live in it. For twelve years he was a deputy United States marshal and for many years was sheriff of Ford County, having been elected to the latter office for twelve years in succession prior to January, 1911. He is a Democrat and each victory was won in a county that is strongly Republican. During his service as sheriff of Ford county he made a great many important captures and arrests of desperate frontier characters—old outlaws who had for years defied arrests—such as cattle thieves, bank and train robbers, etc. He was a terror to these notorious characters, who in the early history of western Kansas reigned in bands in that part of the state and along the border of the old Indian Territory. Dodge City was for many years a rendezvous for this undesirable element, and to Mr. Bell’s tact and ability as an officer is largely due the credit for eradicating the “bad men” in that section. He made Dodge City be good and is now esteemed by all for his good work in this direction. Unlike many men who occupied the office of sheriff in those “wild days,” Mr. Bell was never accused of shooting a man or of using drastic means in effecting an arrest. Today  he remains a link connecting the old order with the new, well and popularly known from the Rio Grande in Texas to the British possessions among cattlemen and cowboys as “Ham” Bell, respected by them as a fearless officer, and by all as a public-spirited citizen. When the government abandoned Fort Dodge as a military post, there was a lack of decision among the people as to the best use to be made of the grounds and buildings. It was Mr. Bell who originated the idea of converting the place into a State Soldiers’ Home. He broached the project to John McEvalla and Captain Howard, old soldiers of Dodge City, who secured a favorable resolution from their Grand Army Post. He has always manifested a great regard and kindness for the old veterans of the Civil War, and was not only the means of securing the State Soldiers’ Home at Fort Dodge, but when the district reunion of soldiers was held there Mr. Bell, almost wholly alone, secured and collected about $1,000 to defray expenses, besides which he contributed largely of his own means to their entertainment and comfort. It was through his efforts that the reunion was held there. 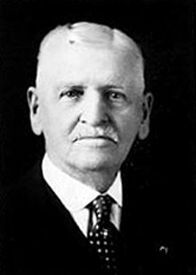 In 1910 he was appointed chief of police of Dodge City. That same year he erected one of the most modern automobile garages in Kansas, and has a large and well equipped auto livery, with an elegantly furnished ladies’ rest room, one of the few of its kind in the West and a haven for auto tourists to Colorado. Mr. Bell is a member of the American Auto Association and of the Touring Club of America. The penniless boy of forty-four years ago is today a wealthy man. He has made it in Kansas, by brawn, brain and intelligent and industrious effort. Besides his garage he has an 8,000-acre ranch near Dodge City, where he raises horses and is extensively engaged in the cattle business. Mr. Bell was married on August 1, 1874, to Miss Josephine Dugan, a daughter of James Dugan, a farmer of Barber County, Kansas. To this union was born one son, Hamilton B. Bell, Jr., born November 22, 1876, who is now  a traveling salesman, with headquarters at Salt Lake City, Utah. Mrs. Bell died on October 7, 1900. Mr. Bell is a Knight Templar Mason, a Noble of the Mystic Shrine, and a member of the Benevolent and Protective Order of Elks. 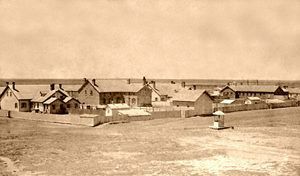 During the thirty-five years or more of his residence a Dodge City no citizen has been more closely identified with its upbuilding and with the development of southwestern Kansas than has Mr. Bell. Generous to a fault, he has both made and spent fortunes, but he still remains an active and energetic business man, wealthy, popular, and occupying an enviable position in the love and esteem of his fellow citizens. Editor’s Note: After this 1912 account, Hamilton Bell continued to live in Dodge City until his death in 1947. He was the longest living Old West Sheriff and Marshal in the history of the American West. 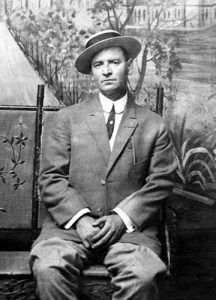 Living in lawless Dodge City during its boisterous cattle days, he was acquainted and or friends with such men as Wyatt Earp, Doc Holliday, Luke Short, Bat Masterson and numerous other colorful Old West characters. The rigid, stand-up lawman who seldom drew his guns and never shot a man during his 30 years of law enforcement, arrested more outlaws, with a warrant, than any other lawman in the West. He retired about 1911 and, at the age of ninety, was operating a pet shop in Dodge City, selling canaries, his favorite bird.